The Kaysville Tabernacle construction began in 1912 and the building was dedicated May 24, 1914. When the old adobe meetinghouse of The Church of Jesus Christ of Latter-day Saints, built between 1855 and 1863, became too small, Kaysville, Utah, architect William Allen was commissioned to design a new church across the street. The cost was estimated at $60,000 with the Kaysville Ward's share set at $30,000. John R. Barnes thought of a plan to raise the money. He deposited $6,000 in the bank to be turned over to the bishop only after the rest of the money was raised. Mr. Barnes' one request was that two large cement spheres be cast to decorate the steps. John W. Burton gave the ward the land, valued at $1,000, for the building. John Flint gave $3,000. Bennett Paint and Glass Company of Salt Lake made the windows and the brick came from the Kaysville Brick Company. When the tabernacle was dedicated it was fully paid for. A groundbreaking ceremony was held July 24, 1912, under the direction of Bishop Henry H. Blood, who later served as Utah's governor from 1933 to 1941. The Tabernacle combines "modern" and Greek Revival styling and is noted for its beautiful stained glass windows. 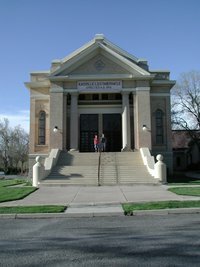 The Tabernacle is designated as a Utah Historic Site. During the building of the Tabernacle, Alex Barnes died when his wheelbarrow of cement tipped off a steep ramp used to carry materials to the top of the high building. Source: "Kaysville Our Town" Carol Ivans Collett 1976 edition, 134-137. This page was last edited on 30 August 2011, at 14:22.